The really clever bit is in the VSPARS rig vision and sail vision software. A few simple taps on the VSPARS touchscreen display is all that’s needed to set up the sail vision system to track the sail stripes. Advanced filtering and detection algorithms result in a very high success rate, meaning that sail graphics and sunlight effects will not usually prevent the stripes from being tracked. 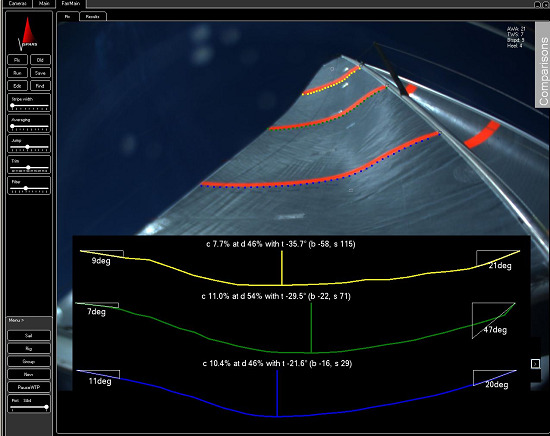 The VSPARS software enables the user to compare sail and rig shapes qualitatively (on the image below in black) and quantitatively on screen with previously captured setups whilst being given continuously updated vital sail and rig shape design parameters and measurements. The current sail vision stripes are found and displayed. Previous results can be selected and displayed on screen (on the image below in grey) giving a visual comparison and trim aid. The VSPARS database of previous setups, filtered by current conditions, provides easily selectable comparisons to the current situation. The graphical sail vision display shows the sail depth, entry angle, exit angle and twists. See how VSPARS sail vision and rig vision can benefit your campaign or find out about the VSPARS algorithm validation.